Do not attempt this without the assistance or support of your licensed aircraft mechanic! This altimeter is easily adjusted while you sit in the cockpit of the plane. Before starting be sure to obtain an accurate barometric pressure reading from a local weather service, and know "for sure" what your exact altitude is as you make the adjustment. 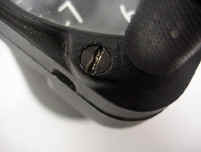 You will find a small screw near the main adjusting knob, just to the left and a little above, on the instrument bezel. We'll call this screw #1. This screw must be removed. Its purpose is to hold another "apparent" screw in position. We'll call this second screw screw #2. You may not be able to see the "apparent" screw (screw #2) as it is positioned on the side of the bezel rather than on the front. Although it has a screw head, it has no threads. It simply slides in and out of the hole it occupies. 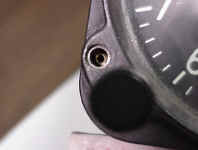 By removing screw #1, located on the front of the bezel, you will release the "fixed" condition of this side screw (screw #2). Once you have removed screw #1, you will be able to see what is shown in this picture. 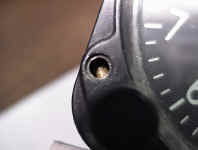 It displays the threaded hole through the shaft of screw #2. Use a paper clip or piece of safety wire to slide the screw #2 slightly "up", or out of its hole (only 1/16th of an inch or so). The picture to the right shows the screw shaft after it has been slid slightly out of position. Once this condition is reached, you can simply pull the adjusting knob out and turn it to change the barometric reading in the Kollsman window without changing the altitude setting. 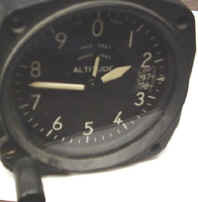 Begin by first setting the altimeter to the exact altitude of the field. Next, listen for the current barometric pressure reading. Next, pull out on the adjusting knob and set the barometric pressure to the correct amount in the Kollsman window. You may have to try this a couple of times because when you release the adjusting knob it must fit between some gears. As it snaps into place it may move the setting slightly. 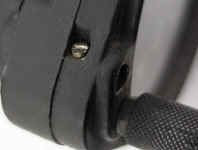 Once the adjustment as been completed, use safety wire or paper clip to slide screw #2 back into its original position. You may have to re-align it with the viewing hole in order to re-position screw #1. Re-tighten screw #1 and you're finished!